A short 5 mile circular walk near Napton. Wonderful views and the famous Napton Windmill. For over half the walk you enjoy a delightful section of the MILLENNIUM WAY. The way is clearly waymarked with the distinctive black Millennium Way circular waymarkers. Find out more about the walk by clicking on the information icon. 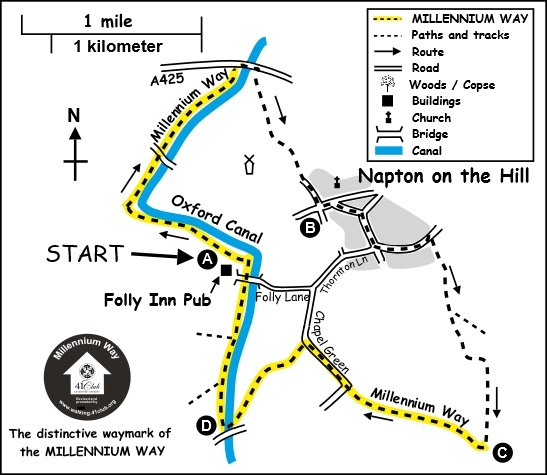 This circular walk starts from The Folly Inn situated at the end of Folly Lane, just by the Oxford Canal, and accessed via the village of Napton-on-the-Hill. Having arrived at the aforementioned lane turn left and immediately take the right fork to go slightly downhill, after some 300 yards take fork left, passing some dwellings on right to reach a junction. Continue left at this junction to pass High View and Hill Rise cottages on your right. Turn downhill into Chapel Lane and after approx 50 paces bear right at the concrete bollard to go downhill with wooden fence & cottage on left, then continue past an attractive thatched cottage - The Old Bakery - on your right, to reach the road. Continue gently downhill through the village turning left at the bottom into Dog Lane. ( If you fancy a coffee and cake you can turn right here for a few yards to reach the Napton Post Office where there is an attractive cafe and shop, then retrace your steps to continue the walk.) Go past St Lawrence School, then past St Lawrence Close, soon to arrive at a waymarked bridleway on right, next to a red brick house. Proceed down the bridleway ignoring the first stile ( next to second metal gate ) on your left and continue gently uphill on grassy track to take the large metal gate ahead of you into a field. Keep ahead with hedge right and go through a metal gate. Continue on to reach a second metal gate - do not take this gate - turn left just before the gate to stay in same field and now keeping hedge right for approx 100 yds to take wide gap on your right into another field. Now, stay ahead with hedge right for approx 150 yds to the field corner, eventually to cross a small concrete bridge and through metal gate. Continue ahead with hedge right taking a further metal gate to turn right onto the Millennium Way. Keeping wire fence and hedge right, you will notice a farm appearing a few hundred yards to the far left. When you draw level with the farm you will be at a gate in the field corner, which leads to a minor road. Here you will notice the distinctive black Millennium Way waymarker. Take the gate and follow waymarker go right up the road to pass a small dwelling with "1890" inlaid in the wall. After some 500yds come to a T-junction, go ahead signposted Napton / Stockton. Eventually, pass four small terraced cottages left (The Fens) and immediately take driveway on left. Proceed up driveway going right behind buildings and walk between fence on left with hedge right to come to stile. Take stile and follow direction of the way marker across the field to come to a rather makeshift bridge ( with waymarker ) in the dip. Cross the bridge and go diagonally left up field to exit by far left corner gate to road (adjacent to a large oak tree). Go right on road over canal bridge then immediately left down to reach the Oxford canal tow path. Go immediately left under the bridge (No: 115) continuing with canal right. 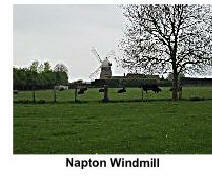 Looking ahead you will have a fine view of Napton- on-the-Hill with its high set windmill. (This canal was designed by James Brindley and eventually links up with the Grand Union canal further north). 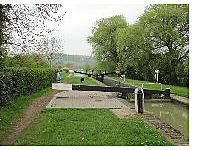 Follow down a flight of locks to eventually arrive back at The Folly Inn on left. In the Middle Ages, Napton was one of the largest towns in Warwickshire with a population of approximately 1000 people, which is more or less the same as today. The name Napton is derived from the Anglo Saxon meaning hilltop settlement. 500 feet above sea level, the village has commanding views over Warwickshire. Seven counties are said to be visible from the top on a fine day and it is probable that an Iron Age fort once crowned its summit. Remains of extensive medieval strip farming systems can be seen in the surrounding countryside. 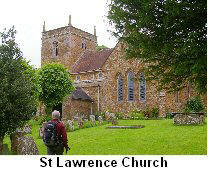 St Lawrence Church dates from the 12th C and has three Norman windows in the north wall. On the vestry door is a strange grill covered by a heavy shutter. Nobody knows the purpose for which it was intended; a spy hole or maybe a confessional; who can tell? Two grey-gowned Elizabethan ladies are said to haunt the church. They kneel in the front pew quietly praying. Several present day villagers say they have seen them but who they are/were nobody knows. The Windmill existed before 1543 and was derelict by 1966 but is now restored. The Domesday Book records the manor as being held by Robert de Beaumont, Count of Meulan. In 1107 Henry I made de Beaumont Earl of Leicester. Edward II granted a charter for a market but after this died out the village has stagnated, the population today being the same as in 1400, around 1000. The Oxford Canal reached Napton in 1774, this was the head of navigation until 1777 and goods for Banbury and beyond travelled by road. 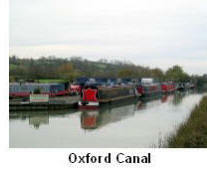 The Warwick Napton canal joined the Oxford Canal at Napton Junction in 1800. The Folly Inn by the canal was originally a farmhouse, then became known as the Bull and Butcher and catered for the brickworks in nearby Kiln Road. It closed just after the second world war, but reopened in 1992 and is now a well-used boating hostelry. A much more direct route between London and the Midlands, the Grand Junction Canal, was completed in 1805. Much of the London-bound traffic switched to this faster route, as it avoided passage of the River Thames. This greatly reduced Oxford Canal traffic south of Napton. During the 1960s pleasure boating began to grow in popularity and replace the old trading boats. After a fact-finding cruise on the canal, Barbara Castle (then Minister for Transport) rejected a proposal for closure. The canal is now thriving. In the summer it is one of the most crowded canals on the network.